There have been an increasing number of business failures, nearly bankruptcies and even totally bankruptcy. Will your company be one? Will your major customers or suppliers go bankrupt? What warning signs exist, and what can be done to avoid corporate failure? Bankruptcy is the final declaration of a company’s inability to sustain current operations given the current debt obligations. This post comprehensively discusses those issues. Read on…. Majority of firms require loans and therefore increase their liabilities during their operations in order to expand, improve, or even just survive. The degree to which a firm has current debt in excess of assets is the most common factor in bankruptcy. If you can predict with reasonable accuracy ahead of time that your company is developing financial distress, you can better protect yourself and your company. The CFO can reap significant rewards and benefits from a predictive model for his or her own purposes. CFOs have to try to build early warning systems to detect the likelihood of bankruptcy. Although financial ratio analysis is useful in predicting failure, it is limited because the methodology is basically univariate. Each ratio is examined in isolation, and it is up to the CFO to use professional judgment to determine whether a set of financial ratios are developing into a meaningful analysis. In this post I will discuss the three famous bankruptcy predicition models, i.e. : Altman’s Z-score, Degree of Relative Liquidity and the Lambda Index [LI] that CFO’s use the most. But before that, discussing some warning signs as to future corporate failure is useful. What Warning Signs Exist As To Future Corporate Failure? In order to overcome the shortcomings of financial ratio analysis, it is necessary to combine mutually exclusive ratios into groups to develop a meaningful predictive model. Regression analysis and multiple discriminant analysis (MDA) are two statistical techniques that have been used to predict the financial strength of a company. Three predictive bankruptcy models are discussed on this post. They are the Z-score model, the degree of relative liquidity model, and the Lambda index model. 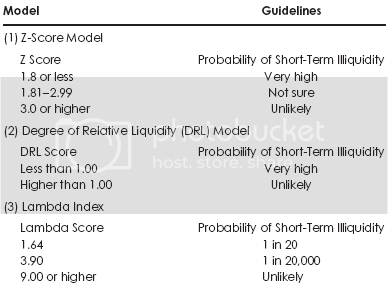 The “Z-score model [Z-score]“ evaluates a combination of several financial ratios to predict the likelihood of future bankruptcy. The model, developed by Edward Altman, uses multiple discriminant analysis to give a relative prediction of whether a firm will go bankrupt within five years. The “Degree of Relative Liquidity [DRL]“ model evaluates a firm’s ability to meet its short-term obligations. This model also uses discriminant analysis by combining several ratios to derive a percentage figure that indicates the firm’s ability to meet short-term obligations. The “Lambda Index [LI]“ model evaluates a firm’s ability to generate or obtain cash on a short-term basis to meet current obligations and therefore predict solvency. These models are outlined and described in detail below. X3 = Debt service. Earnings before interest and taxes to total interest payments. X4 = Cumulative profitability. Retained earnings to total assets. X5 = Liquidity. Current assets to current liabilities. X6 = Capitalization. Equity to total capital. X7 = Size measured by the firm’s total assets. Conclusion: The probability of failure is not likely. The “Degree of Relative Liquidity“ has been proposed as an alternative method for measuring the liquidity of a small firm and can have significant applications for larger companies. It has been compared to the two common liquidity ratios, the current and acid-test (or quick) ratios, which are often used to evaluate the liquidity of a firm. However, under certain circumstances, these two ratios sometimes provide incomplete and often misleading indications of a firm’s ability to meet its short-term obligations and may be opposite to the trend at hand. A logical approach to evaluating several liquidity measures simultaneously is to consider how appropriately each measure responds to changes relative to direction and degree of sensitivity. Current. An obsolete or slow-moving inventory and uncollectible accounts receivable may distort this ratio. Acid-test. Uncollectible receivables and the exclusion of inventories can provide an incomplete picture. If the DRL ratio is greater than 1.00 (or 100 percent), the firm can meet its current obligations for the period and have some net working capital available at the end of the period. If the DRL is less than 1.00, the firm should seek outside working capital financing before the end of the period. The DRL can be derived by dividing the total cash potential (TCP) by expected cash expenditures (E) in the operating period. The TCP is the sum of initial cash potential and the cash potential from normal operations. The initial cash potential is reflected in the beginning working capital (WC), assuming reported values can be realized in cash. The cash potential from operations can be determined by multiplying the operating turnover rate (OT) by the sales of value of existing finished goods inventory (SVI). The operating turnover rate (OT) reflects the number of times the sales value of finished goods inventory (at retail) and accounts receivables (net of un-collectibles) is converted into cash in an operating period. The sales value of finished goods inventory (SVI) is the adjustment of inventory at cost to retail value. The expected cash expenditures (E) are derived by subtracting cash flow from operations from net sales (NSV). Cash flow from operations can be derived by accrual net income (NI) plus noncash expenses (NON) plus the change in working capital (WCC). The Lambda index is a ratio that focuses on two relevant components of liquidity—short-term cash balances and available credit—to gauge the probability that a firm will become insolvent. The index measures the probability of a company going bankrupt, and it includes the key aspect of uncertainty in cash flow measurement by utilizing a sample standard deviation. In consequence, it can be used like a z value from the standard normal distribution table. Net cash flow is the balance of cash receipts less cash outlays. Unused lines of credit, short-term investments, and cash balances make up the initial liquid reserve. The uncertainty is based on the standard deviation of net cash flow. In order to calculate and utilize the Lambda index, a cash forecast should be used. A worksheet can be prepared to contain 11 line items in the following order from top to bottom: short-term line of credit, beginning liquid assets, adjustments, initial liquid reserve, total sources of funds, total uses of funds, ending liquid assets, ending liquid reserve, standard deviation, the Lambda index, and, finally, additional cash required to maintain a Lambda of three. A firm’s short-term line of credit may not change during the course of the forecast (i.e., one year), which simplifies calculations. Liquid assets, by definition, include marketable securities and cash at the start of the forecast summary. By having an adjustments line item, one can see the result of decreasing or increasing the cash level. The initial liquid reserve is the total short-term line of credit with any adjustments. The total sources and uses of funds are forecasts by company management, resulting in a positive or negative net cash flow. The Lambda value should rise if a firm’s short-term line of credit does not change and it has a positive net cash flow. Ending liquid assets is the sum of three values: beginning liquid assets, adjustments, and net cash flow. Ending liquid reserve is the sum of two values: short-term line of credit and ending liquid assets. The standard deviation is drawn from the net cash flows from period to period. Next, the Lambda index is calculated by dividing the ending liquid reserve by the standard deviation. And finally, the last line item is additional cash needed to hold a Lambda of 3. A negative number here indicates a Lambda value of greater than 3 and, hence, a safer firm financially. A high negative value here, assuming that management is confident of its forecasts, may point out that those funds could be better utilized somewhere else. Once an index value has been determined using the equation, the pertinent odds can be found by referencing a standard normal distribution table. For example, a Lambda of 2.33 has a value of .9901 from the table, which says that there is a 99 percent chance that problems will not occur and a 1 percent chance that they will. Generally, a firm with a Lambda value of 9 or higher is financially healthy. And firms with a Lambda of 15 or more are considered very safe. A Lambda value of 3 translates to 1 chance in 1,000 that necessary cash outlays will exceed available cash on hand. A Lambda value of 3.9 puts the probability at 1 in 20,000. A low Lambda of 1.64 is equivalent to a 1 in 20 chance of required disbursements exceeding available cash on hand. A worksheet that keeps a running tally of Lambda shows how changes in the financial picture affect future cash balances. There are a number of positive aspects to using the Lambda index. The Lambda index focuses on the key factors of liquidity, available unused credit and cash flows, which by contrast are ignored by standard cash forecasts. Furthermore, by including the standard deviation of cash flows, Lambda penalizes irregular cash flows. The result of higher changes in cash flows would be a lower Lambda. A drawback to Lambda, however, is the fact that it is significantly tied to revenue forecasts, which at times can be suspect depending on the time horizon and the industry involved. A strong Lambda does not carry much weight if a firm is not confident about its forecast. Which Bankruptcy Prediction Model Should I Use? Different people may use the Z score in varying ways. The Z score offers an excellent measure of the probability of a firm’s insolvency, but like any tool, it must used be with care and skill. The Z score should be evaluated over a number of years and should not be the sole basis of evaluation. The Z score can also be used to compare the stability of different firms. Care should also be exercised when the Z score is used for this purpose. The firms must be in the same market offering the very similar, if not the same, products. In addition, the measure must be taken across the same period of years. These similarities are requirements in order to eliminate external environmental factors that would be reflected in the score. The DRL is a more comprehensive measure of liquidity than the current ratio or the acid-test ratio. However, like the current and the acid-test ratios, the DRL is a relative measure and should be used only in relation to either the firm’s own historical DRL or to those of other businesses. Since the DRL does not incorporate the timing and variances in cash flows, comparing the DRL of two dissimilar firms is hazardous. It is important to note that the DRL does correctly identify an improved or deteriorated liquidity position; however, it does not suggest explicit causes of change. The DRL does provide a basis from which to pursue an analysis and interpretation of those causes of change because the derivation of the DRL requires input for all the factors that are relevant to liquidity position. As with DRL, the Lambda index is a method for gauging a firm’s liquidity, but one should consider a firm’s historical background and always use common sense in evaluating any calculated value. A weak point of this model is that in order to calculate the index, forecasted figures must be used, making the final Lambda value somewhat suspect in some cases. When a company fails, it can either be reorganized or dissolved. Business failure can occur in a number of ways including a poor rate of return, technical insolvency, or bankruptcy. According to law, failure of a company can either be technical insolvency or bankruptcy. Creditors have recourse against the company’s assets. Some reasons for business failure include poor management, lawsuit, overexpansion, an economic downturn affecting the company and/or industry, and catastrophe. What Can Be Done To Avoid Business Failure? Avoid heavy debt. If liabilities are excessive, finance with equity. Dispose of unprofitable divisions and product lines. Manage assets for maximum return at the least practical risk. Stagger and extend the maturity dates of debt. Use quantitative techniques, such as multiple regression analysis, to compute the correlation between variables and the possibility of business failure. Ensure that a safety buffer exists between actual status and compliance requirements (e.g., working capital) in loan agreements. Have a negative correlation between products and investments. Vertically and horizontally diversify the product line and operations. Finance assets with liabilities of similar maturity (hedging). Enhance marketing efforts (e.g., advertise in the right place). Minimize the adverse impact of inflation and recession on the business (e.g., price on a next-in, first-out basis). Invest in multipurpose, rather than single-purpose, assets, because of their lower risks. Reconsider entering industries with a high rate of failure. Have many projects, rather than only a few, that significantly affect operations. Consider introducing product lines that are the least affected by the business cycle and have stable demand. Avoid going from a labor-intensive to a capital intensive business because the latter has a high degree of operating leverage. Avoid long-term fixed-fee contracts to customers. Incorporate inflation adjustment and energy-cost indices in contracts. 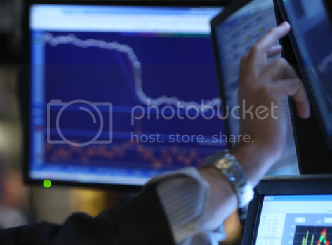 Avoid entering markets on the downturn or that are highly competitive. Related Topics:Altman's Z-scoreAltman's Z-score Application ExampleAltman’s Z-score Bankruptcy Prediction ModelDegree of Relative LiquidityDegree of Relative Liquidity (DRL) ModelLambda Index [LI]Overcome Potential Business BankruptcyOvercome Potential Business FailureUsing Three Bankruptcy Prediction ModelsWhat Can Be Done To Avoid Business Failure?What Warning Signs Exist As To Future Corporate FailureWhich Bankruptcy Prediction Model Should I Use?